This is the time of year when many elderly people from all across the United States and Canada begin to head to the southern parts of the U.S. to escape the harsh mid-western, northern and Canadian winter. One disadvantage, for those who are genealogy enthusiasts, is that they cannot attend talks, lectures, and workshops that are held by genealogy groups and societies in their home state/country. Florida is probably the most popular place to winter for these "snowbirds." So, what opportunities are available in Florida to attend Irish specific genealogy group and society meetings over the winter months? The Groups/Societies/Institutions (GSI) database on this website lists all of these types of organizations in the U.S. and Canada that I am currently aware of. * This includes two genealogical societies in Florida. Firstly, there is the Lee County Genealogical Society - Irish Special Interest Group. They meet in Fort Myers, which is on the Gulf Coast side of the state, about a 50 minute drive north of Naples, FL. Secondly, there is The Villages Genealogical Society, which also has an Irish genealogy special interest group. This group is located in north central Florida, about a one hour drive north-west of Orlando. Therefore, if you are a Florida snowbird, there are opportunities to meet with other Irish genealogy enthusiasts and learn something new. *If your GSI is not listed, please comment at the end of this post, or on the GSI database webpage, and I will add your organization to the list. All in all, this is a very useful publication for anyone with pre-Famine ancestors in Lowell, MA. A word of caution though, as with all of these types of early biographic/city history publications, there are no citations from primary sources. Use the information as a guide in your research and, as much as is possible, verify any information with primary documents. Click here to read this publication. 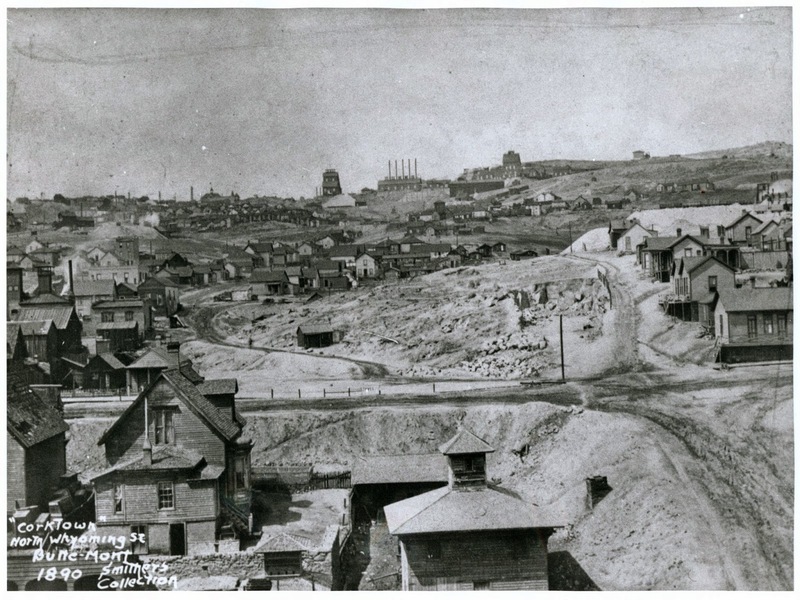 I have also previously written about St. Patrick's Cemetery in Lowell, click here to read. O'Dwyer, George Francis. 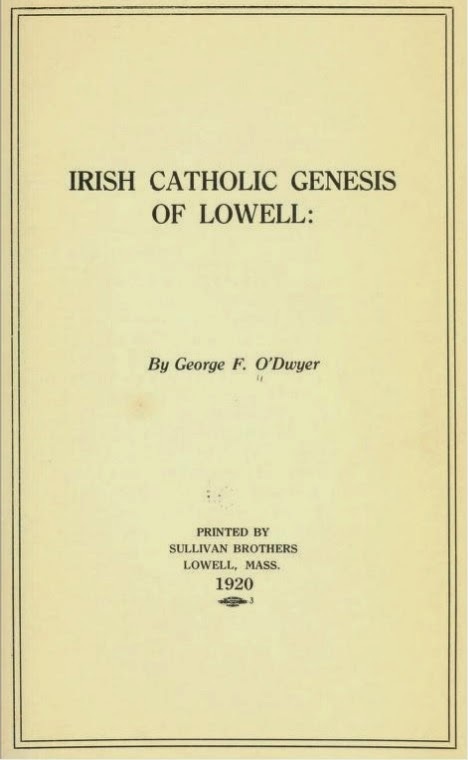 The Irish Catholic Genesis of Lowell. Lowell, MA: Sullivan Bros. 1920. Next week sees the 2014 edition of the National Archives Virtual Genealogy Fair take place over three days - Tuesday (28th), Wednesday (29th), and Thursday (30th). All the talks will be available to view for free on YouTube, beginning at 10am eastern (3pm GMT). All levels of expertise are catered for, with the first talk being Introduction to Genealogy and other talks focusing on such topics as federal land records and FBI case files. One talk caught my eye: Great Granny Eunice came from Ireland, Grandpa Fred was in the War, Can Access Archival Databases (AAD) Help Me? This is on at 10am on Wednesday, October 29th. The AAD contains a number of different databases, of which the stand out for those with Irish ancestry is Records for Passengers Who Arrived at the Port of New York During the Irish Famine, created, 1977 - 1989, documenting the period 1/12/1846 - 12/31/1851. It will be interesting to see if this is what the Irish aspect is or if there is more to be obtained from the AAD if you have Irish ancestors. 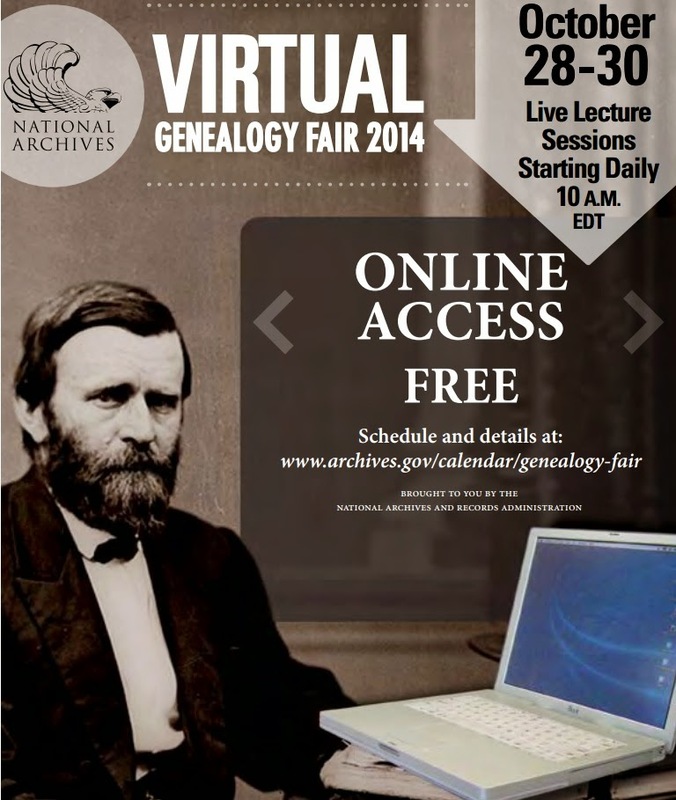 Click here to access the Virtual Genealogy Fair website. Labels: Expert, Famine, Genealogy TV, Immigration, Migration, U.S.A.
Townland of Origin is delighted to welcome back professional genealogist Lisa Walsh Dougherty. Her previous posts, How a Professional Genealogist Found Her Townland Of Origin (Part 1 & Part 2), were widely read, with the part one post having the highest number of views since the blog was launched. Lisa has been an avid family history researcher for nearly 20 years. Since 2009, she has shared her knowledge and experience with many through her volunteer hours, workshop trainings, and commissioned research. A member of the Association of Professional Genealogists and a graduate of the ProGen Study Group, she specializes in helping people with Irish roots discover their “Townland of Origin”. Lisa is based in Upstate New York near Albany, and provides a free consultation toward assisting you in finding your own unique family story! You can find out more about Lisa's work on her website, Upstate NY Genealogy and her Association of Professional Genealogists profile. 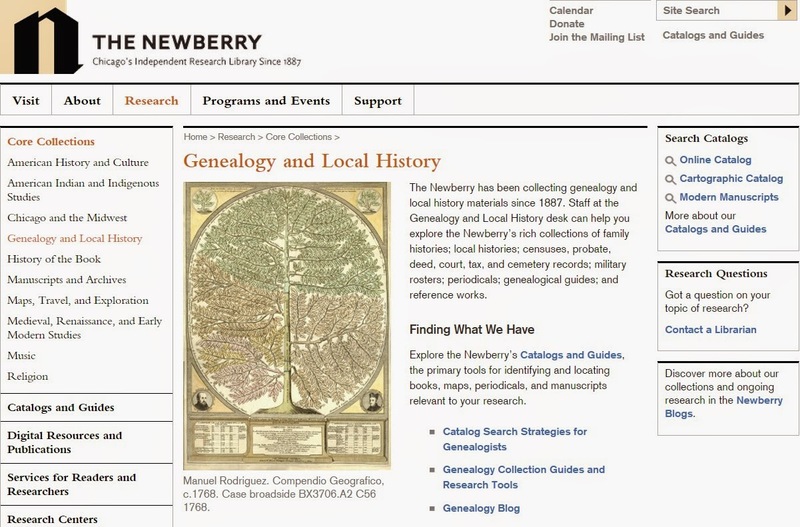 This is the second post about using a Proof Argument in your genealogical research (scroll down if on the homepage or click here to read Lisa's first post). The commonality of names, lack of documentation stating the place of origin in Ireland, and socio-economic status of Irish immigrants are all common problems that those doing Irish genealogical research in the U.S. and Canada face. Using a Proof Argument in your research can help you develop a body of acceptable evidence that helps you break through these brick walls. In her paper, linked to below, Lisa examined the evidence she collected about her great-great-grandfather, Patrick Penders, in an attempt to determine if he was a native of County Clare. She outlines how she approached this specific genealogical problem, presenting evidence, findings and sources to support her theory. A copy of this research was donated to the excellent Clare County Library Genealogy and Family History Division. You can read it on their website, click here. Townland of Origin is delighted to welcome back professional genealogist Lisa Walsh Dougherty. Her previous posts, How a Professional Genealogist Found Her Townland Of Origin (Part 1 & Part 2), were widely read, with the part one post having the highest number of views since the blog was launched. In this post, Lisa writes about using a Proof Argument in your research. On Tuesday (21st), you will have a chance to read an example where she used a Proof Argument in her family history research. To say the road our ancestors took to get from Ireland to the United States (or the UK, or Australia, etc) was a long and winding one would be an understatement. They endured many hardships and obstacles along the way, but still they persevered. The road back from the 21st century to the Ireland our ancestors knew can be just as long and in many ways, more complicated. The return journey is not for the faint of heart, only the most persistent and determined will reach their ultimate goal of a townland of origin. Sometimes the luck of the Irish will be on our side, and we will find that long-anticipated place name in the first document we examine. Others may unearth record after record over many years before even the smallest clue is yielded. Either way the Irish family historian is all too often left with questions about the place they have found. What does it all mean? Is it a townland or parish? County or Poor Law Union? The real work in Irish genealogy begins once that mysterious location is found. Then the researcher must make the effort to find out what they can about that place. What type of place is it? Does it still exist? Where can it found on a map? What kinds of records exist for that place? What is the corresponding parish for that place and when do those records begin? There is rarely a single document that gives all the answers about an ancestor. Most often there is a combination of documents and sources, a variety of items that together form the circumstantial evidence those of us researching our Irish origins get used to seeing. Melding these divergent pieces into a comprehensive whole that tells the story of our Irish ancestors takes real skill. In genealogy, this gathering, analysis and summarizing is called a proof argument. The Board for Certification of Genealogists defines a proof argument as "a detailed, written explanation of the evidence and reasoning used to reach a genealogical conclusion." If ever there was a genre of genealogy made for the proof argument, it would be Irish genealogy. The majority of the records pertaining to our ancestor in their adopted country usually say nothing more specific than “Ireland”, records kept in Ireland itself vary greatly in quality and scope, and the names of our ancestors are so common it can be nearly impossible to tell one “John Ryan” from another. Assembling and analyzing large amounts of data is an essential procedure toward discovering our ancestor’s home, and to skip these vital steps would do our research a great disservice. In the computer, tablet and smart phone era that we live in, we get used to instant gratification. The proof argument simply is not something that can be achieved by plugging a surname into Google. Its origins involve gathering, sorting, categorizing, contemplating, analyzing, savoring, and finally, recording information that sometimes takes years to accumulate. While sources for Irish genealogy and other ethnicities are exploding online and are far more readily available than they were even a few years ago, an effective proof argument, and therefore an accurate family story, can only be achieved with patience and diligence. Our ancestors would have been familiar with these qualities; they mastered them and started a new life that we are all benefitting from. Laura A. DeGrazia, CG. Skillbuilding: Proof Arguments. Onboard. No. 15. January 2009. pp. 1-3. Available online at http://www.bcgcertification.org/skillbuilders/skbld091.html: accessed 17 September 2014. This coming Saturday, October 18th, I'll be speaking about finding your Irish ancestors in New York City at the Genealogy Event . This is on at the National Archives and Records Administration, Bowling Green, Manhattan. It's a three day event, beginning on Friday. My talk is one of the advanced sessions and is on in Meeting Room 1, from 11:00am to 12:30pm. 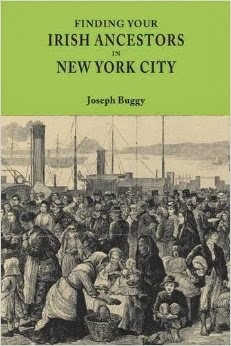 Saturday, 18 October: Finding Your Irish Ancestors in New York City. The Genealogy Event. Venue: NARA, Alexander Hamilton US Custom House, 1 Bowling Green, New York, NY 10004, USA. Meeting Room 1, 11:00am - 12:30pm. Ticket Purchase required. This post is about 'information wanted' ads in a Philadelphia newspaper, the Catholic Herald. Scroll down if on the homepage or click here to learn what 'information wanted' ads are and to read about the most famous example of them: those in the Boston Pilot newspaper. The Catholic Herald newspaper was published weekly in Philadelphia, PA from 1833 to 1856. Before 1833, this paper existed in various incarnations, first hitting the Philadelphia newsstands in 1822, titled The Catholic Herald and Advocate. After 1856, it merged with various other newspapers (click here for a full explanation of Catholic newspaper mergers in 19th century Philadelphia). Villanova University Digital Library: 1835-1848, various years and editions. Philadelphia Archdiocesan Historical Research Center microfilms, the center has the following copies: January 3, 1833 through January 4, 1862; January 10, 1863 through December 24, 1864; Sept. 7 and 28, 1867. Schive Mowrer, Rita. The Catholic Herald (varied dates, 1833-1846) Philadelphia, Pennsylvania, excerpts of genealogical interest. Philadelphia, PA: Historical Society of Pennsylvania. 1970. Chronicling America. About The Catholic herald. (Philadelphia [Pa.) 1833-1856. Year Unknown. Available online at http://chroniclingamerica.loc.gov/lccn/sn87052015: accessed 5 September 2014.